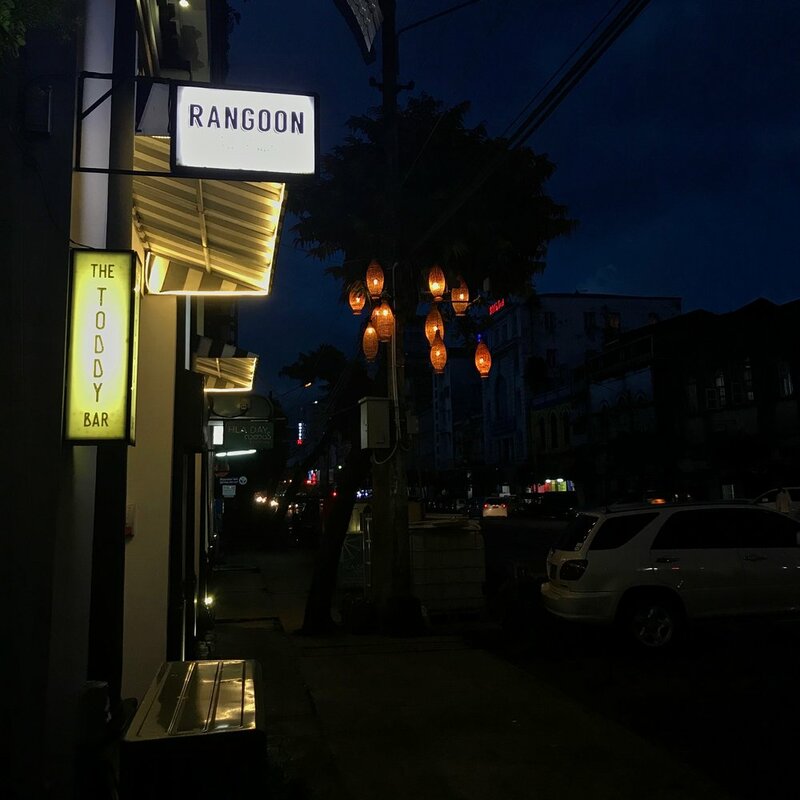 Tucked away in the historic downtown of Yangon, find The Rangoon Tea House. The white walls, black trim, and teak wood accents are callbacks to Yangon’s colonial rule, and simultaneously pays homage to classic teahouses of Yangon. High ceilings, Myanmar street fare (mutton samosas, anyone? ), and incredibly friendly people. The new-ish tea house seems to be thriving within the Yangon market, but there are loftier goals for RTH. The owners, U Htet Myet Oo and Ma Myat Mitzu, are working to raise the standard of traditional Myanmar food, and eventually bring it to the international stage. And yes, I can vouch for their super tasty dishes (we went twice in a week), but to Myet Oo and Myat Mitzu it's more about the progress of Myanmar than just food. RTH aims to meet international workplace standards, including paying overtime, which is incredibly rare in Myanmar. Also, the owners are trying their best to hire staff from Yangon and throughout Myanmar. So they are not only bringing a new take to a somewhat forgotten cuisine, but RTH is driven to make improvements from within. Their overall goal will take some work. But I can already say that the locally-inspired fare and mixologist-produced Hot Toddy bar are already on the cusp of slingshotting RTH toward international notoriety. They were ‘UGE, almost the size of lobster tails. But unlike most grilled shrimp, they were super easy to eat because the prawns were sliced in half, openly grilled, and made easy to fork right out of the shell. Served with a crudely chopped garlic and lime, oh my. Just too good. This is a very traditional Myanmar dish, - I would argue the most ubiquitous. I think Michael and I tried at least 8 versions at this point, but RTH’s was the best. 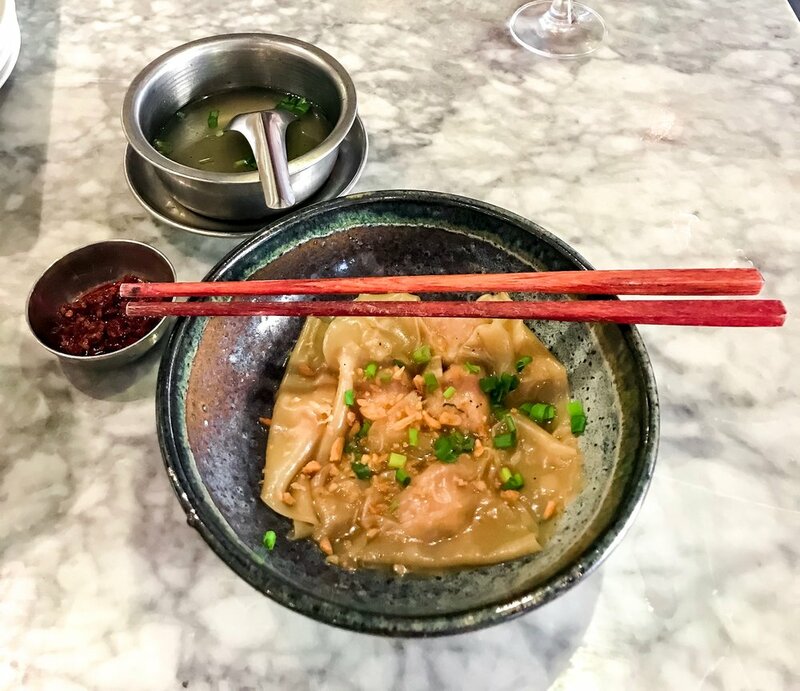 The tea leaves are fermented, and served over a bed of peanuts, garlic chips, toasted sunflower seeds and sesame seeds, chopped green chilies, fish sauce, and a generous amount of lime. Sounds like an odd combination, but it’s delicious. Be careful not to eat this too late though, you’ll be wired afterwards. Alright, I’m aware that this is not traditional Burmese food. However, the pork belly was slow roasted, giving it the consistency of melted butter that was perfectly cut with tangy BBQ sauce. But the perfect touch came from the single, thick slice of cold cucumber. My only complaint is that it’s a serving of one. So much nostalgia for me here. My family and I used to go to a small Vietnamese restaurant, where I would order the Rangoon Wontons. I honestly thought this was some bastardization of multiple Asian cuisines, but I was so wrong. These were very similar to the wontons I remember. The small, doughy triangles are filled with a delicate dollop of ground shrimp and pork. And served alongside is this garlicky chicken broth that's ladled over the steamed pockets. I was definitely brought back with these little gems. It was good, but with most champagne drinks - and yes I'm including mimosas - it was too sweet for me. I could see this being nice to sip on during brunch, but maybe not the best drink with which to start out a booze-filled night. A local craft beer that was such a nice change from the super filtered beer I’ve had on this trip. If you've been part of the craft beer craze, it won't astound you. However, if you've been traveling for 5 months and haven't had a decent beer, this will absolutely hit the spot. Much better than the Bella Bellini. The junmai sake has a little bit of a smoky flavor, and the kaffir lime and wine provided something a little sweet and bitter, it's mild and refreshing. The smoked cinnamon is brought out on the tiniest gold plate, then the drink is mixed table side. It reminded me of cocktail bars in Austin, a little excessive but so appreciated.